The report released Thursday night by the Bremen Police Department says Bremen High School Principal Bruce Jennings contacted police on Feb. 20, 2014, after Xaver, then a student, reported having such a dream a previous night and again during a nap he took at school. The report says Xaver’s mother agreed to take him to a behavioral health center, and police took no further action. A fourth victim has been identified after a shooting at a Florida bank that left five women dead. Maine Montague tells NBC News that his 31-year-old wife Jessica Montague was killed in Wednesday’s shooting. Montague’s name and the names of two of the other victims had been withheld by law enforcement officials in compliance with a newly passed victims’ rights law in Florida. Tim Williams said at a news conference Thursday afternoon that 38-year-old Ana Pinon Williams just recently began as an employee of the SunTrust branch in Sebring, Florida, where a man shot the women execution-style on Wednesday. But he says she quickly came to love her job and co-workers. He said “these same people argue that we need to pass new laws and exert more control over people,” an apparent reference to the calls for more gun control that have come after other mass shootings. A man who was trying to make a deposit at the bank where five women were fatally shot says he saw the shooting victims through the doorway and someone walking among them. Victor Sparks is quoted by the Highlands News-Sun as saying that he and his wife went to the bank Wednesday but he couldn’t get in because the door was locked. Sparks says when he peered inside, he saw people lying on the floor and someone walking among them. He says that as he turned and walked away, he heard a big bang. Sparks says he and his wife, Deanna Sparks, then called 911. He says police arrived on the scene within two minutes. 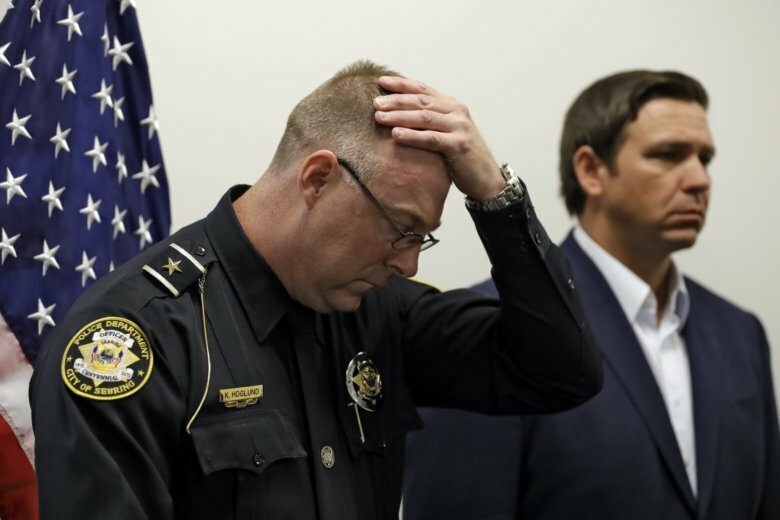 Police say some of the names of the Florida bank shooting victims will not be released under a new state law passed by voters in November. Sebring Police Chief Karl Hoglund said at a news conference Thursday that authorities would withhold the identities of three of the five female victims at the request of their relatives. The decision marks the first high-profile use of the victim-shielding provision of a new constitutional amendment similar to a 2008 California initiative called Marsy’s Law. The amendment establishes the right to prevent disclosure of information that can be used to locate or harass victims or their relatives. Police have identified Wednesday’s shooter as 21-year-old Zephen Xaver, who had recently moved to Florida from Indiana. He has been charged with five counts of premeditated murder. Police say the man who confessed to fatally shooting five women in a Florida bank would not let authorities into the branch after more than an hour of negotiations. A police affidavit says all five women were found lying face down in the bank’s lobby Wednesday with gunshots to the backs of their heads. The affidavit says shell casings from the shooter’s 9 mm handgun were scattered on the floor, and authorities found the shooter in an office in the rear of the bank. Police have identified the shooter as 21-year-old Zephen Xaver, who had recently moved to Florida from Indiana. (This item has been edited to correct that the details of how the shooting victims were found were contained in an affidavit, not released by the police chief). Sebring, Florida Police Chief Karl Hoglund says they have no known motive for a massacre inside the SunTrust Bank branch. He says 21-year-old Zephen Xaver has been charged with five counts of premeditated murder in the shooting deaths of four bank employees and a customer, all of them women. The chief says the shooter had no apparent connection to the women or the bank. Josh Xaver told CNN he’s “heartbroken for the victims” of his son, Zephen Xaver. The Associated Press has reached out to both parents of Zephen Xaver requesting interviews, with no immediate response. The superintendent of a northern Indiana school district says a man accused of fatally shooting five people inside a Florida bank branch attended classes there for portions of two school years several years ago. But Superintendent Jim White of Bremen Public Schools says federal law prevents him from disclosing any details about any former student’s school record. White said suspected 21-year-old gunman Zephen Xaver attended Bremen High School for a portion of the 2012-13 school year and returned for a “brief period” the next year. White told The Associated Press that Xaver did not graduate from the school after attending classes there during what would have been his senior year. A man who dialed 911 from inside a bank branch where he said he killed five people is being held without bond on five counts of premeditated murder. Twenty-one-year-old Zephen Xaver was appointed a public defender during a brief court appearance in Highlands County on Thursday morning. He wore a black-and-white striped prison uniform. Sebring police say Xaver called them from inside the SunTrust Bank branch in central Florida Wednesday to report that he had opened fire. He barricaded himself inside and when negotiations failed, the SWAT team burst in, capturing Xaver and discovering the bodies. A witness is describing how police finally captured the suspect in a mass shooting inside a bank in Sebring, Florida. Stefan Roehrig told WFLA-Ch. 8 that a SWAT team tried to storm the bank with an armored vehicle. He says deputies attached cables to the door handles, but instead of ripping the doors open they just pulled the handles off. So Roehrig said deputies then drove the armored vehicle right through the doors. He says the SWAT team soon led the gunman out in handcuffs. Zephen Xaver is in custody now, held for the deaths of five people. A woman identifying herself as the ex-girlfriend of the suspect in a mass shooting inside a Florida bank says he often thought about hurting people and has long been fascinated with death and guns. WSBT in South Bend, Indiana, reported that Alex Gerlach said she tried to warn people about Zephen Xaver’s potential for harm. Xaver was arrested by a SWAT team inside a SunTrust Bank branch in Sebring, Florida, on Wednesday after he called 911 to say he opened fire. Five people were killed. The Washington Post also interviewed Gerlach, reporting among other things that Xaver told her last week that he had purchased a gun. She told the Post that “no one thought anything of it” because he had always liked guns.